One out of three people in the United States – more than 128 million – visit Facebook every day, and about 24 million in the United Kingdom do the same, the company said on Tuesday, releasing regional data for the first time as a way of helping advertisers understand how people use the social network. It is also part of a larger push to go after dollars earmarked for TV commercials, the top choice among advertisers when they launch campaigns. “We would like to be able to be explicit and say this is the amount of people you can reach tomorrow, or the amount of people you can reach when you are launching a movie,” said Carolyn Everson, Facebook vice president of global marketing solutions. Consider that almost 6 million people tuned in to watch the mid-season premier of AMC’s highly anticipated series “Breaking Bad” on Sunday. With more than 1 billion users, there is little doubt about the popularity of the world’s No. 1 social network, but advertisers often need much more data to make decisions. Rebecca Lieb, a media and advertising analyst at Altimeter Group, said one billion is an abstract number. “As impressive and as big as Facebook is, by breaking it down more regionally we are getting more of an idea,” she said. Facebook also released on Tuesday the number of active monthly and daily mobile users in the United States and the U.K.
Television commands the largest share of advertising money spent in the United States at 39 percent, according to eMarketer research, which estimated that $66.3 billion in ad dollars would go towards TV this year. Digital advertising represents about 25 percent of 2013 estimated advertising spend at $42 billion. Still, there is a shift occurring: the average time spent daily with digital media is expected to surpass TV viewing for the first time this year, according to eMarketer. Underscoring the change taking place in people’s habits, WPP founder and Chief Executive Martin Sorrell expects up to 45 percent of the agency’s business to go towards digital within five years, he wrote in post on LinkedIn. 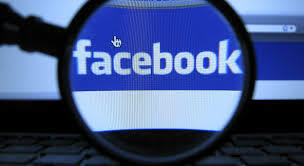 Facebook delivered its strongest ad revenue growth performance in almost two years in July as it benefited from 18 months of retooling its products, including a mobile version of its service. Total ad revenue in the second quarter was $1.6 billion and its shares are up almost 50 percent over the past month. The company is widely expected to launch a revamped video advertising service, but Facebook’s Everson declined to comment on this. “The conversation now is how can you reach this amount of people and target them,” Everson said about how advertisers want to limit the amount of “waste” spent on trying to reach the right consumer. She said that because Facebook’s audience is so large, it has the ability to target consumers. “Sitting and watching the screen is different than clicking and operating on an agenda,” he said.